Introducing Autism & Beyond, a free-to-download app that uses advanced video technology, and can now help parents find out if their child is at risk for autism by showing a series of short videos that elicit reactions in children, the resulting facial patterns, microreactions, and behaviors are analyzed in real-time to give feedback if there is a potential risk for autism. The app is powered by Apple ResearchKit, which now allows families from all over the globe to participate in a worldwide study of autism. This breakthrough in technology is available to anyone who owns a smart device. The Autism & Beyond app is designed to work like an interactive selfie using the iPhone or iPad’s built in self-facing camera that records children’s reactions right after watching a 20-second video clip. 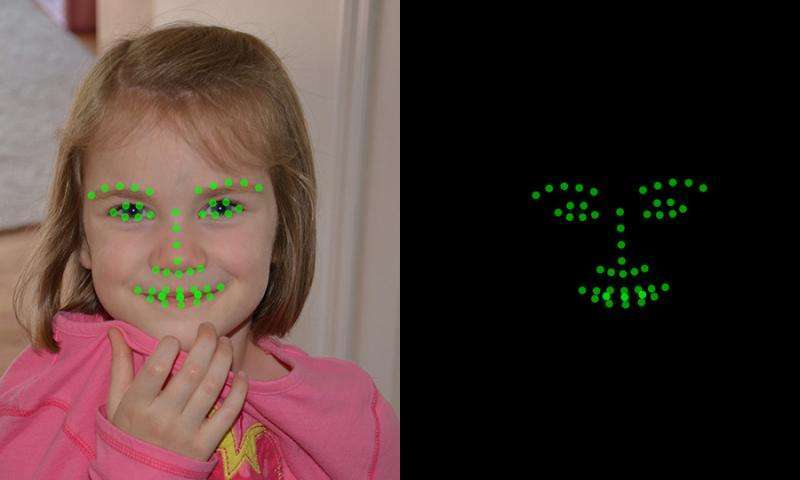 The app scans the child’s facial expressions and uses a series of monitors to determine expressions (as shown in the image below). The app then collects data using the visual patterns that are displayed by green or red dots (the dots appear green when the child is smiling, and turn red when they frown).Ultimately, the dots are what allow the app to offer real-time feedback, should the child display symptoms of autism. Alternatively, parents can just opt to record the visual patterns if they do not want to show their child’s face when submitting the data, which will then be used to track and monitor differing behavior patterns and reactions from app users worldwide. “We analyze the video to track position and movement of the head and face, including the lips, eyes and nose–all of which indicate emotions,” states Dr. Guillermo Sapiro, a professor at Duke University, who developed the algorithm. “For example, while watching stimuli like a funny video, does the child smile, look toward the caregiver or ask the caregiver to view the video as well? We study all of that. Lack of emotion and social sharing are possible characteristics of childhood autism.” Sapiro emphasizes that the app isn’t a self-diagnosis tool in itself, but rather, is intended to serve as an initial screening tool for autism and other developmental challenges, and it is meant to encourage users to contact a specialist for further evaluation and testing (based on what the app finds). This app is backed by the Duke Institute for Health Innovation (DIHI). And the team includes psychologists, pediatricians, psychiatrists, computer scientists, and engineers who have worked together to bring the app to completion with the bigger goal to help parents all over the world to create new ways to support their children’s healthy development. Autism & Beyond also provides parents with extra learning materials, which they can use more than just the screening feature the app itself. There’s free content to help parents deal with children if tantrums or anxiety attacks happen, as well as questionnaires and references should the child be at apparent risk for autism. However, to reiterate, this app does not substitute a trip to the doctor and in some cases, parents are encouraged to seek further help from the right specialists. That said, this is an innovative way of raising awareness and helping individuals be proactive about their own (and their child’s) health. Related: What is it really like to be living with autism? 13-year-old Rosie shares her experience.